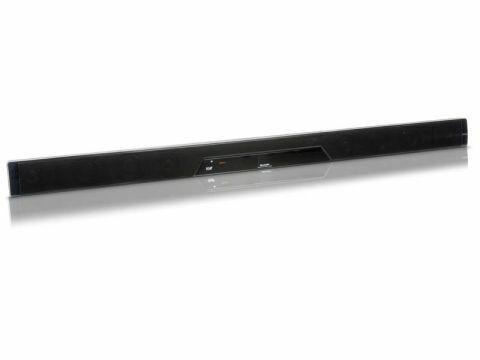 Sharp's skinny HT-SB400 soundbar looks like the ideal upgrade for your TV. It's a smart-looking system and only slightly longer than your average 40-inch TV, so it would suit anything from a 37-inch to 46-inch set. It's shallow too, with brackets and screws included for easy wall-mounting. Throw in a nifty credit card-sized remote control and you have a very convenient TV upgrade. It's also one of the most affordable soundbars around, which inevitably means some corners have been cut. You'll have noticed that there's no subwoofer for starters, but at least you do have line level outputs to add an active sub later if you wish and buttons on the remote to control it. More frustrating is the lack of a digital audio input, which limits it to a fuzzy analogue connection with your TV instead of a cleaner optical link from your receiver. At least this keeps things simple. With your receiver connected to your TV by HDMI, the soundbar will just take the stereo feed from the TV and whatever channel you're watching and boost the volume. The auto on function means it springs into life from standby whenever it detects a signal, so you won't even have to pick up the extra remote. The narrow form factor limits the size of the drive units, which makes their potent output all the more surprising. This so called '3.1 system' has distinct left, centre and right drive units and combined, they are able to project a very loud and clear sound that's perfect for dialogue. Dial it all the way up to 60 and it reaches the back of even a very large room while remaining crisp and controlled. It is not using Dolby processing to separate the 3.1 channels, so the surround sound is less convincing. Sharp has instead chosen SRS sound modes to give an impression of cinema sound, but it only really succeeds in widening the front sound stage a little. It actually sounds more natural and evenly balanced in straight stereo mode. The bass frequencies are conspicuous by their absence and to get that satisfying warmth and bass rumble you'll need to add a subwoofer at some point. However, this doesn't mean the sound is tinny. The most impressive aspect is the way it holds together at quite loud volumes. If you're not looking for serious cinema sound, it does an excellent job of delivering dialogue for regular television viewing.